Join me for a fantastic Mountain Biking day ride incorporating the purpose-built mountain bike trail centre in Swinley Forest. 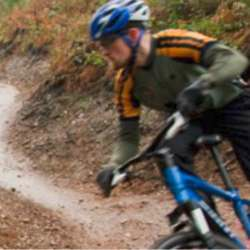 If you own or are prepared to hire a good quality Mountain Bike are happy on fairly easy off-road trails but would like to improve, this is a great opportunity to develop your mountain biking skills in this one of a series of all day rides in or around MTB trail centres within about an hour's drive of Reading. Bikes can usually be hired in the trails centres. We will go by car or minibus from Reading train station or you can take your own transport and meet directly at the start. The event is free but I will ask for a contribution for fuel/transport cost if you travel with me. You don't have to have significant mountain biking skills already but should be relatively fit and able to manage some off-road climbs and be happy being out all day. We will have significant breaks for picnic lunch and refreshments. According to my own grading system, I classify this as level 3/4 due to the duration and the potential climbing involved. As I am currently undergoing the British Cycling MTB leadership program, I can give some basic mountain biking coaching that should help you to improve your riding skills (ready position, breaking on descents, mobility around the bike, cornering). The technical difficulty of the main part of the ride will be fairly easy and corresponds to the blue trail level, usually incorporating one of the blue trails as part of the day's ride. Depending on the particular environment, we may have an optional 1 hour free riding trail session where you can try out more challenging trail centre red or even black trails. - Helmet and appropriate clothing, including shoes, gloves, glasses and waterproofs for a days' riding. - Optional elbow and knee protection if you wish. Advisable: spare inner tube, puncture repair kit, first-aid kit, mobile phone.